We change planes in Dallas, and I cannot help but notice the dramatic change in the passengers. Flying to the ski-crazed area of Gunnison, Colorado means that I am now in the midst of people who are obviously more rugged. More cowboy-looking than those flying to Dallas. These are The Beautiful People, wearing their expensive dark brown leather cowboy hats and boots. They live in expensive homes. Immediately upon arriving in Crested Butte and reviewing the mountain ski trail map, I find myself asking, “Have I gotten in over my head here?” A disconcerting number of trails are double-black diamond, which is a bit intimidating in Colorado: The Land of Serious Skiing. How serious? 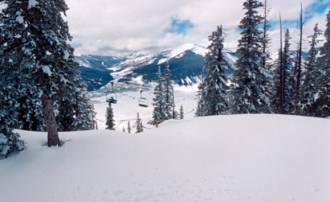 On the day of our arrival, we learn that today is the last day of the annual US EXTREME Skiing Championships, held every year in Crested Butte, which provides many suitable, impossible-to-ski trails for the most talented, suicidal, have-no-fear skiers. Earlier at the airport, for example, we are looking at a wall map of the ski runs, and a guy who appears to be a native informs us that one of the double-black runs I point to is infamously known to have the steepest pitch of any named ski run in North America. Gulp. Sunday morning is my first day on these slopes. Today I am to learn what the general Crested Butte experience consists of. A great many of the trails are rather easy greens and blues. There are also a great many double-black expert-only trails. And there is very little in-between. I therefore find myself frequently on trails I have no business being on over the course of my week here. Scary, but I am forced to sharpen my skills as a matter of survival. Nevertheless, my first day is a wonderful, endorphin-loaded day of excellent skiing. My favorite runs on the mountain, I learn, are International (a black diamond cruiser run that is wide but often quite steep), Ruby Chief, Resurrection, and North Pass. 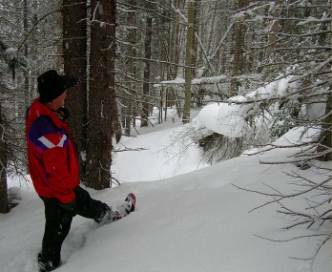 We also enjoy some of the many quite steep tree glade runs on North Slope, and “Double Gap” trail off the East River Lift. In general, I am to learn that the Resort has a relatively large number of missing trail signs, which leads to a number of wrong turns and scratching of heads. 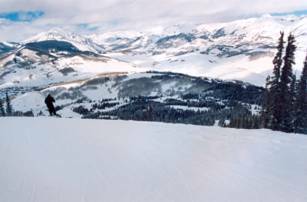 The snow-covered mountains on the horizon, as we look across the grand sweep in front of us at the tops of mountain lifts, are blanketed with deep, fresh powder that has just fallen on this western side of the Continental Divide. Crested Butte has gotten over 260 inches of snow for the still incomplete season by the time we arrive. Looking out the window as we eat breakfast this morning, we decide the snowfall is too heavy to enjoy skiing in. “Plan B” is to go snowshoeing. So we go to the Nordic center in town to rent snowshoes for my buddy Mike (I have brought my eBay-purchased snowshoes along with me in my travel luggage). We set off in deep snow toward the thick pine forest nearby. At 10,000 feet of elevation, the snowshoe tracks we follow up the very steep slope (no switchbacks??) have us very quickly out of breath. We meet locals heading down the slope and they inform us that the trail normally switches back and forth along the grade, but today the official trail is hidden by the snow. We opt to terminate following the tracks up what seems like a cliff, and instead start moving cross-grade. The hiking becomes much more enjoyable and less strenuous. The deep powder we walk through feels like a “cloud walking,” and the forest is pleasantly silent. We shoot some brief video footage which our commentary alleges is showing us on the third day of a lost-in-the-wilderness hike. We are out of food and water. Things have gotten desperate. We somehow find our way back to the center to return the rental gear. 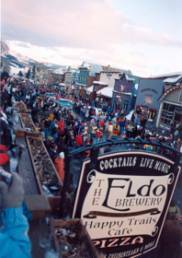 We are off to the Elk Avenue – the Crested Butte main street -- in search of locally-crafted microbeer. Once again, the day ends with a long soak in our condo spa. And today, the soak is more entertaining than normal, as the heavy snowfall has not let up after starting over 16 hours ago. Our outdoor spa therefore deposits a layer of snow on our heads as we sit happily in the steamy water. We look like Q-Tips. Tuesday starts with a dream-like First Trax run down International. Rocketing down the slope, it is the fastest I have ever skied in my life for such a long distance. We are generously treated to a pro bono ski instruction by a very nice woman who works at the shop where we have rented out skis. I fall several times, as our helpful instructor largely fails to break my very bad habits. I am also hobbled by the enormous inconvenience of having one of my ski bindings out of alignment, which makes it nearly impossible for me to snap back into the ski. And that means a lot of my energy is drained. Particularly when my seemingly endless efforts to snap back in means that I lose my adventure buddy and the instructor, who wisely give up on me and head off on their own. But even with the brief instructor assistance earlier in the day, I have become a much better skier by the end of the day. And when she caught up with me later in the day and re-set my bindings, my ski day was excellent. That night, Mike and I go to downtown Crested Butte, where the annual “mini-Mardis Gras” is to be held. We spot an opening on the second floor balcony of The Eldo Brewery, the only pub said to brew their own beer on premises. We soon confirm this by sampling an outstanding “Abominable Strong Ale” and a Scottish Ale as we enjoy the parade. Later, we are unjustly accosted by a local authority, and barely talk our way out of being jailed for alleged misbehavior during the festivities. Curiously, Crested Butte main street contains an astonishing number of real estate offices. Clearly a booming business in this town. At least it was before the housing crash. Our Wednesday weather turns out to be outstanding for skiing. I notice after our Tuesday tutorial that I am happily a better, more confident skier on moguls and relatively ungroomed slopes. Disasterously, we boldly decide to give the dreaded Teocalli Bowl a try. Signs here warn those taking the lift to its summit that only expert slopes await the skier. Our overconfidence once again puts us on an exceptionally steep, wooded glade run. After a number of tumbles and rolls to the bottom of the valley, we learn that the skier must hike out. Seems easy to hike the short, modest hill. But at over 10,000 feet of elevation, our lungs are starved of oxygen, and we are literally GASPING for air after about 10 steps. Every 20 or so steps, we must stop and catch our breath. Finally, we make it to a skiable location, but my chest is heaving and screaming in pain. I am completely exhausted. This explains why there was an emergency call box in the valley. How many unwary, unprepared flat land skiers had to call to be rescued from here? Despite the exhausting nature of Wednesday, Thursday is even more brutal and demanding. Yet it is also the most gratifying day on the slopes. More so than on previous days, we test the limits by attacking so called “expert only” slopes. My sore, bruised body by the end of this battering, eyes-wide-open day is testimony to the difficulties we faced all day. Great powder, great weather. Uncrowded. What more is there to ask for? Near the end of the ski day, we sample what Crested Butte calls a “super pipe.” A massive, freestyle “half-pipe” of snow used by acrobatic snowboarders and skiers. But instead of doing triple somersaults and quadruple 360s, we simply ski up the very steep, very icy, very tall walls of the pipe. We also try out a few “terrain parks” to try out (small) jumps, as we have never done so before. Our last day features fierce, ferocious, bitter cold wind and raging snow. So ferocious that most all skiers find themselves fleeing from the mountain just before lunch hour to seek refuge. The wind is so intensely blowing up the mountain that I find myself nearly at a standstill trying to ski down a very steep black diamond slope to escape. After a week of being tested by some of the best that Crested Butte has to offer, I now know that this mountain requires the skier to stop on a dime. And frankly, I am unable to do so reliably. “International” becomes my favorite run here, and I find myself starting and finishing with that run each day to pump me up.